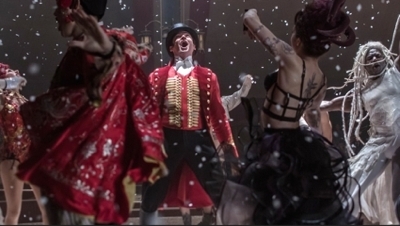 No film is perfect, but The Greatest Showman grabs you from the beginning and holds you with high-energy choreography and singing, great cast performances, and a tent full of positive messages that stand in sharp contrast to what today’s children are reading in the newspapers. Our family loved it. Hugh Jackman nails it as Barnum, but the surprises begin early when an adult Barnum looks at his reflection in a store window and what he sees is his childhood self. The person we meet (Ellis Rubin on camera, Ziv Zaifman in the sound booth) in that segue shot breaks into song, and that song carries through into a long montage that eventually brings us back to the adult Barnum and his great love, Charity (Michelle Williams, with Skylar Dunn playing young Charity). The rest of the film follows Barnum as he moves from unfulfilled New York City accountant to a scammer of loans and the proprietor of a museum of curiosities that will eventually become a museum of live “freaks,” including the famous little person Gen. Tom Thumb (Sam Humphrey), a Bearded Lady (Keala Settle), The Huge Man (Daniel Everidge), The Dog Boy (Luciano Acuna Jr.), and an African-American acrobat (Zendaya) who will become the love interest of Barnum’s eventual partner, Philip Carlyle (Zac Effron). I frankly don’t understand the criticism that The Greatest Showman isn’t deep enough. The accept-everyone-as-equals theme is reinforced in this PG film through a double romance in which one man is looked down upon because of his station in society (class), while another man is looked down upon because he is in love with an African American woman (race). Snobbery is reflected as well in the reviews that New York Herald editor-publisher James Gordon Bennett (Paul Sparks) uses to attack Barnum and his curiosities—though I’ll admit that the exchanges between Barnum and Bennett seem contrived and/or overly familiar, and the relationship between Barnum and Carlyle could have been teased out more. The tipping point in the film derives from Barnum’s fascination with the “Swedish Nightingale,” European opera sensation Jenny Lind (Rebecca Ferguson, with Loren Allred dubbing the singing). That part of this mostly fictional musical biopic is true. Barnum did indeed talk Lind out of retirement in order to sponsor a grand tour across America that paid her the unprecedented amount of $1000 per night plus expenses, and he did indeed stake a personal fortune on the tour. But while he was faithful to his wife of 44 years, there’s little potential in not having at least some innocent temptation, which, in the film, culminates in a surprise publicity kiss on the lips and nothing more. It’s that wholesome. And the music? In the U.K., the soundtrack became only the second in 30 years to occupy the #1 slot for 11 straight weeks. But timing is everything. Though it was nominated for a Golden Globe Best Comedy-Musical award, The Greatest Showman lost to Lady Bird in a crowded field that also included The Disaster Artist, Get Out, and I, Tonya. 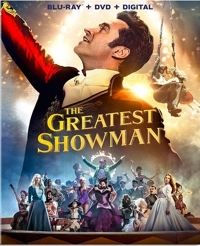 The bottom line for family viewing is that The Greatest Showman has a PG rating for “thematic elements including a brawl.” There are moments where street rabble protest and threaten the performers and at one point a fight breaks out, and there are also moments of peril associated with a fire. Aside from Barnum’s fascination with Lind that’s suggested by his enthralled expression as she performs, there really isn’t much here to keep younger family members from watching. Sensitive children will identify with the marginalized performers who just want to be treated like other human beings, but the entire story is told in such an uplifting manner and supported by dazzling visuals, dancing, and singing, that even those sad moments feel like triumphs rather than defeats. Yes, there’s a sad lull around the two-thirds mark, but The Greatest Showman finishes with a family-first bang.